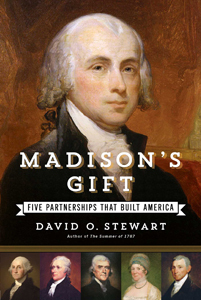 The book is Madison’s Gift: Five Partnerships that Built America . Just as Gen. Washington was indispensable in winning the war, so was Madison indispensable in winning the peace and setting up the first self-governing republic since Rome. David O. Stewart is also president of the Washington Independent Review of Books. His other books include: The Wilson Deception (A New Fraser and Cook Mystery) . The Summer of 1787: The Men Who Invented the Constitution . American Emperor: Aaron Burr’s Challenge to Jefferson’s America .